The news made me suddenly aware of the huge impact she has had on my life and how, although I had never consciously acknowledged it before, I am one of Thatcher’s children and her values are deeply entrenched in my psyche. My mum, dad, brother and I moved from Iran to England at the end of 1979. 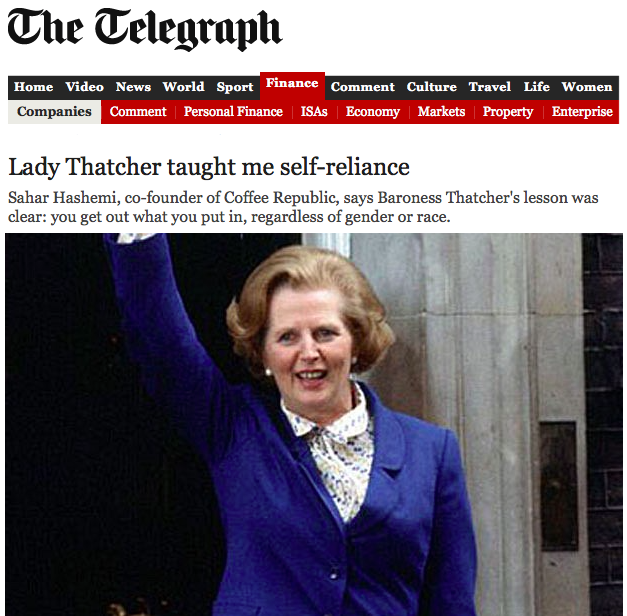 We arrived, unknowingly, in a new Britain and made Baroness Thatcher’s country our home. We took the move towards lower tax rates and curtailed union power for granted, and, perhaps more importantly, didn’t question a culture that encouraged enterprise, aspiration and self-reliance. Reflecting back on the life of Baroness Thatcher, I wonder now how different things would have been had my family arrived in Britain only a few years earlier, when top tax rates stood at 90pc, the country was continuously rocked by strikes, and rubbish littered the streets. I wonder not simply because of Baroness Thatcher’s reforms of business conditions in the country. Her influence on my development as an entrepreneur goes far deeper than that, to my most fundamental beliefs. With hindsight, I now see the huge impact she had on my 12-year-old self and realise that many of my attributes, my conviction that “anyone can do it” and my disregard for “gender issues” are a direct result of the inspiration of a strong and steadfast female prime minister.